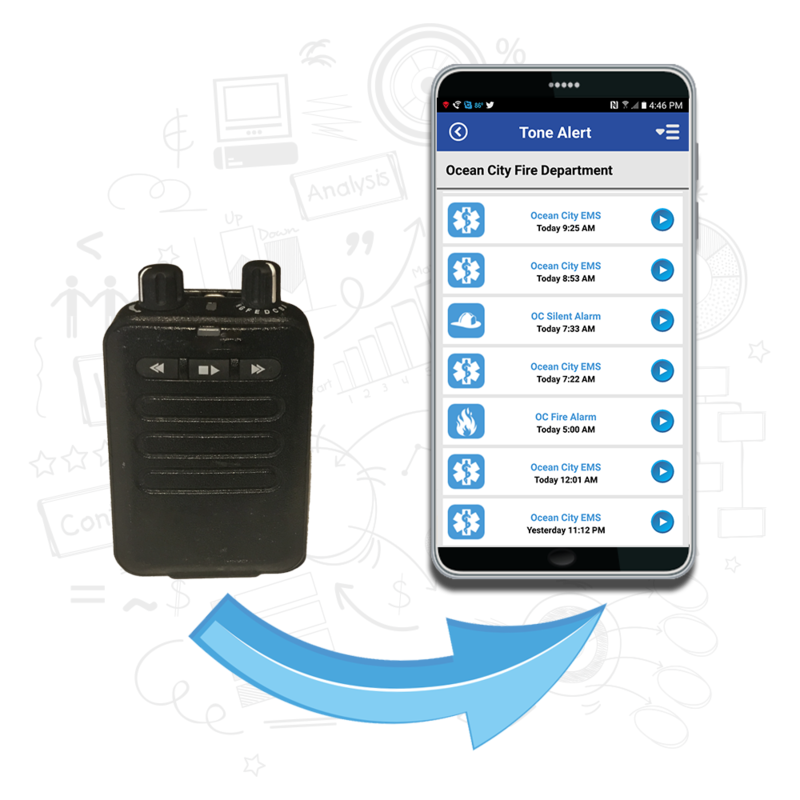 Chief Tone Alert bridges the gap between fire pager dispatching and smartphone notifications. Chief Station Alert provides fast, affordable station alerting to your in-house responders. Chief Web Design creates visually stunning, responsive websites for engaging your community. Increase your staffing by knowing who is responding and where they are with Chief Responders. 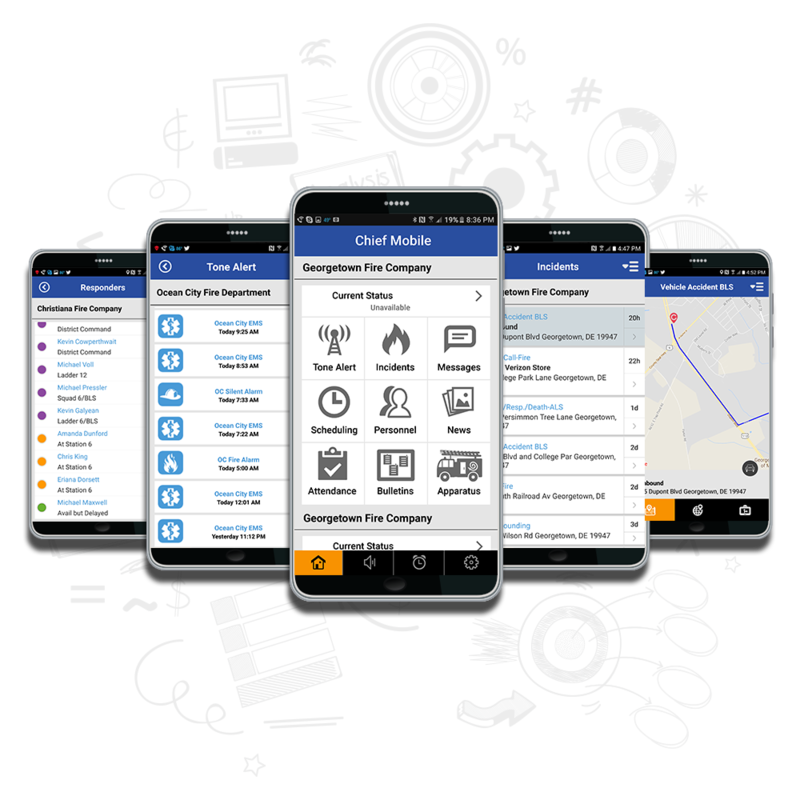 Chief Mobile integrates all Chief Technologies services in one app for your mobile device. 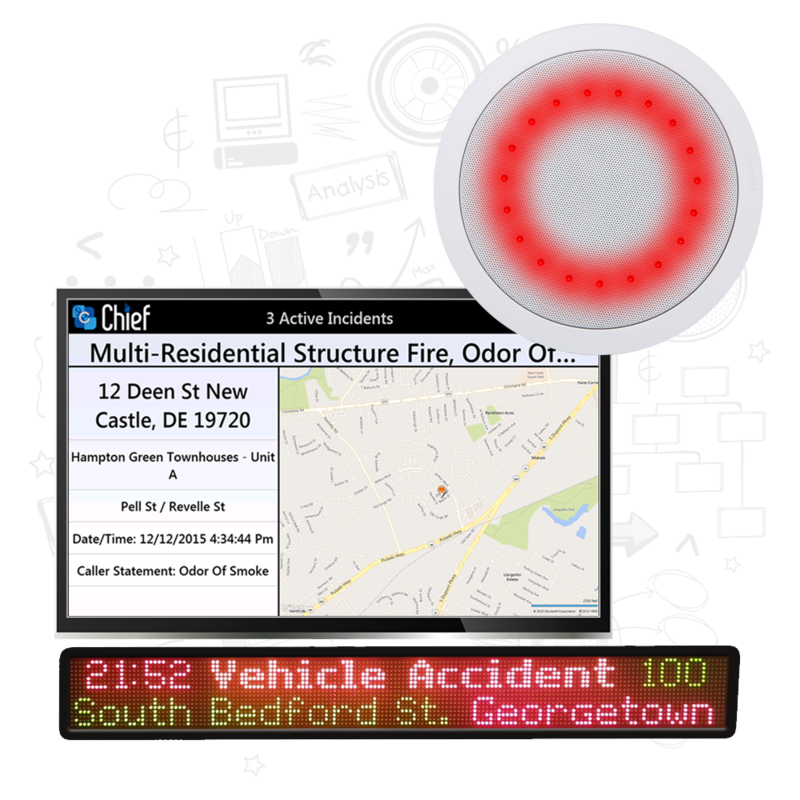 Chief Display increase your visibility with real time incident response information, traffic cams, weather, and more. 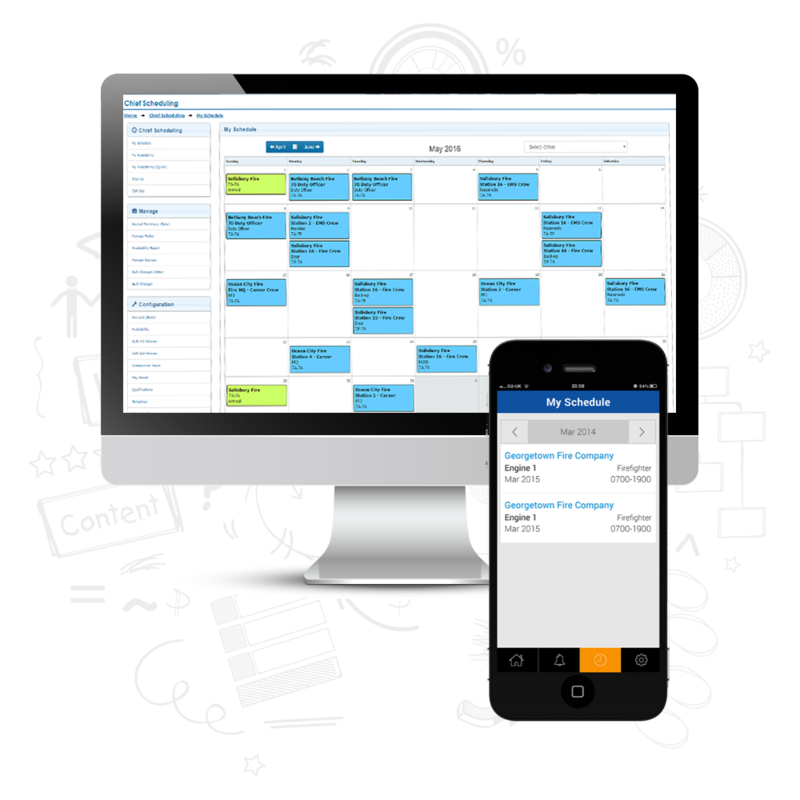 Chief Scheduling is a complete staffing, scheduling and management solution built into the Chief Platform. 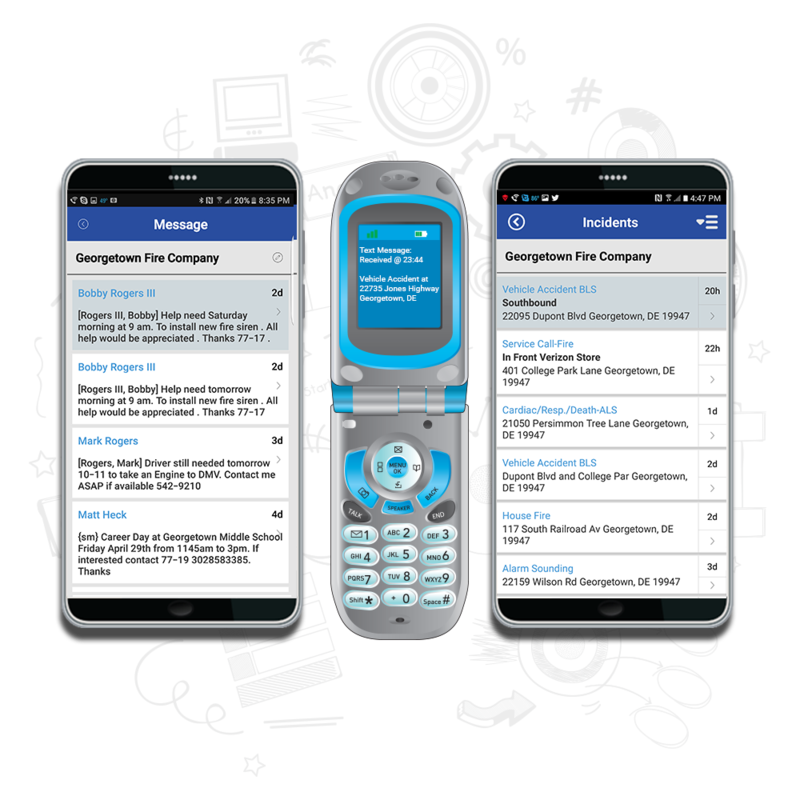 The Chief Mobile app, available for Apple, Android, and Windows recieves alerts from Chief Messaging and provides alerts and notifications based on settings that have been set through the app. Once the app receives an alert, a push notification is displayed on the device. The app provides detailed information about the incident, as well as mapping and turn by turn directions for the user. Chief Mobile does much more than alert dispatches! Status buttons within the app integrate with Chief Responders and Chief Display to show the availability and response of each member responding to a station or the scene, along with their ETA on the in-station display board.Post news to the fire department website hosted by Chief Web Design, manage your alerts, manage your schedule with Chief Scheduling, send messages, and more! Whether your agency currently uses a text based CAD notification system or relies solely on voice-based paging... Chief Tone Alert is for you! Chief Tone Alert allows your staff to receive the same pages they currently receive via pager on their smartphone. Increasing the ability to notify your staff is one sure-fire way to increase turnout at incidents! 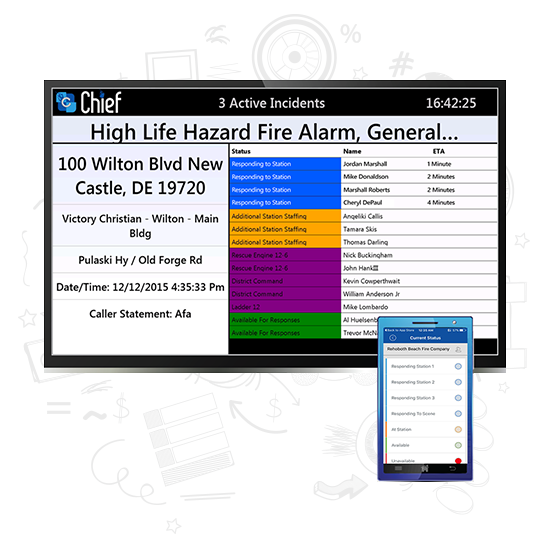 Chief Responders is an integrated system within Chief Mobile and Chief Display that allows personnel to press a button within the application to designate their response. The system utilizes realtime location data of the mobile device to update the station display board and the Chief Mobile App to the ETA of the responder. Chief Responders allows line officers and other responsible personnel to make staffing and mutial aid decisions in real time by being able to see at a glance apparatus staffing levels and any additional incoming personnel. Chief Scheduling is a complete staffing, scheduling, and management solution built into the Chief Platform. You can manage your schedule using the portal through any web browser, or access the system using Chief Mobile. Additionally, Chief Display can show the current staffing from the information in Chief Scheduling. Chief Scheduling also integrates with Chief Messaging, so that off duty staff members have the option to not receive alerts. This feature is especially handy for employees that work with multiple departments. We have launched Chief Tone Alert, which is a service providing dispatch audio to your cell phone. Contact us to sign up your department! We would like to welcome Clayton Fire Company, Delaware to the Chief Tech family! Take a moment and check out their mobile friendly site. Chief Display increases visibility with real time incident response information, traffic cams, weather, and more. No need to process your incidents across multiple systems! With the Chief Platform, utilize your incident data for response, mapping, attendance, websites, station alerting, and more. Your responders are mobile, your systems should be too! 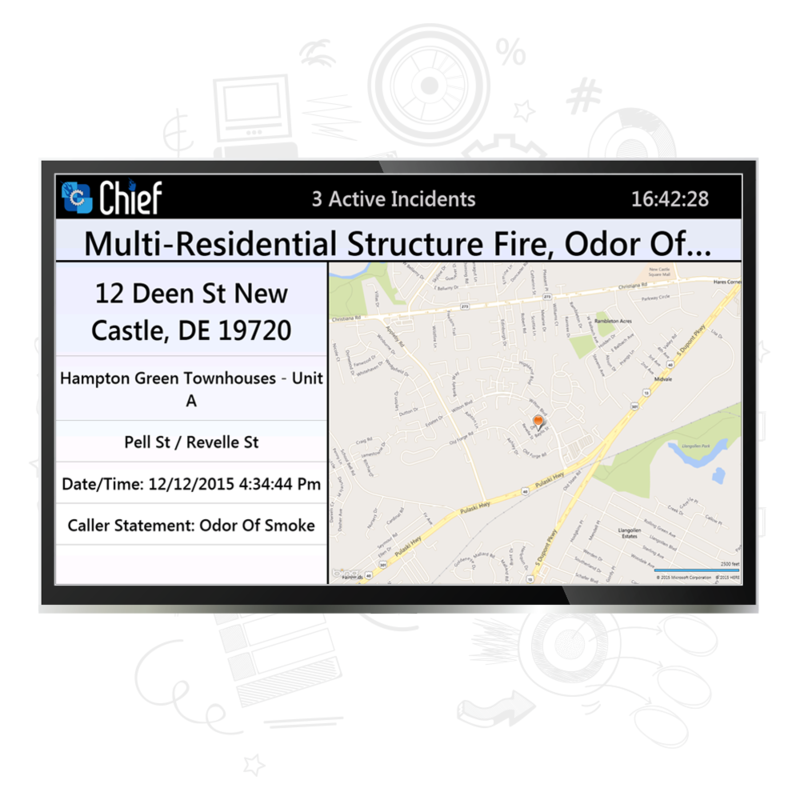 Chief Mobile enables interaction with your responders through incidents, mapping, scheduling, news, attendance and more. Choosing Chief Technologies as your technology provider saves critical funding that can used for other much needed resources by paying one low price for the technology services that you need. Chief Technologies utilizes secure systems to ensure that your information is not comprimised, lost, or mishandled. All features are permission based to comply with your needs.